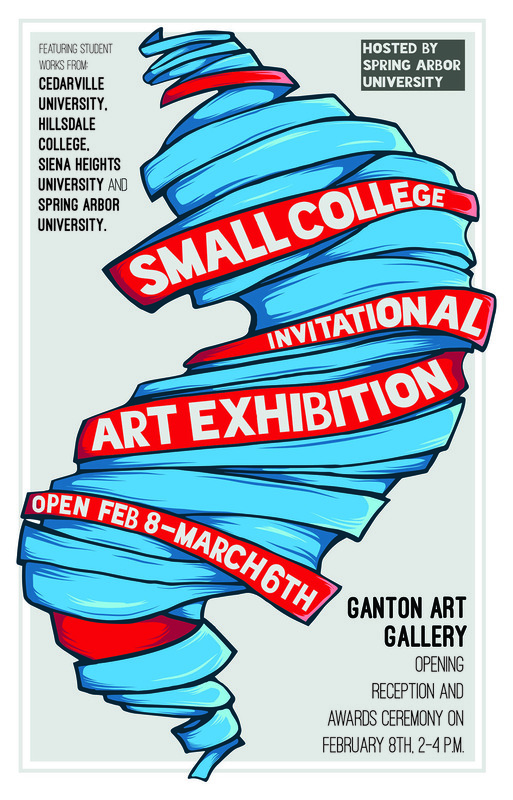 SPRING ARBOR, Mich.—Spring Arbor university art students have 42 works displayed in the Small College Invitational Art Exhibition that opened February 8 in the Ganton Art Gallery. The exhibition includes Spring Arbor University, Sienna Heights University, Hillsdale College and Cedarville University. Spring Arbor University students won the award in the painting, sculpture, graphic design and drawing/printmaking categories. A Sienna Heights University student won the award for photography. Out of 207 pieces entered, 77 were accepted into the show. The juror was a professor of photography from Michigan State University, Peter Glendinning. An awards reception was held February 8 where Glendinning made comments about the winning pieces. Kerri Conrad, winner of the graphic design award, said he noted the quality of her work and that it was portfolio-worthy. Professor of 3D design J.D. Garn said he is biased but SAU’s art program is impressive, especially compared to other schools the same size. The schools competing in this exhibition are about the same size and focus their art programs on good ideas, good technique and good design. Together, the schools donated $1000 to the exhibit. Glendinning decided to divide the money amongst the five categories, with $100 going to each winner and $50 to each honorable mention. Shannon Bardwell, winner of the painting award, said she spent her cash prize to buy another book about painting. Kerri Conrad said, “We have a close-knit community at the SAU art building, and I appreciate the ability to comfortably approach other artists for their opinions.” She said it is constructive to receive criticism and she values others’ critiques. Shannon Bardwell said the encouragement of her peers motivated her to keep working even when she felt her painting wasn’t going to turn out or when she thought she ruined the painting with a brushstroke.